I love this quilt….especially for a little boy (or girl) toddler bed. This one is a crib size, I thought maybe it would be mega cute on my Ryan’s toddler bed someday….except I already have his circle quilt and it would clash with Ben’s quilt since they share a room. Luckily that’s an easy fix…I’ll just make new ones. 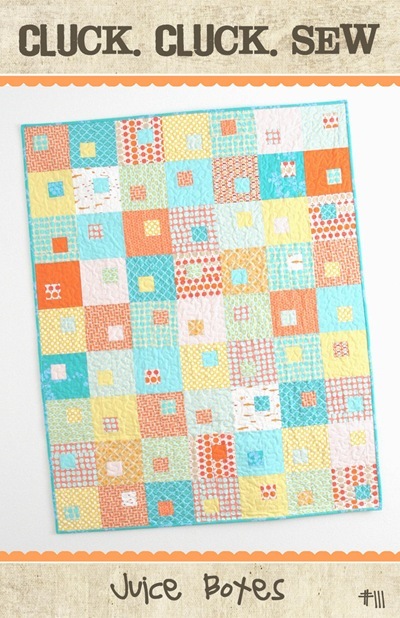 Anyways, this is a great quilt for a beginner and a fast weekend project or last minute baby gift quilt. The fabrics are from lots of different lines. The fish are by Heather Ross, there are a few polka dots and orange basket weave by Denyse Schmidt, a sort of polka dot by Heather Bailey, the darker blue and binding is Anna Marie Horner, and the aqua dot and orange/aqua dot is Amy Butler. Wooo that’s a lot to remember. Oh and the back is Michael Miller’s Zoology in Citron. I think this one is one of my favorites too. I love your fabric choices as well. But, on the other hand, when do I not!! Oooh, I love this one! The fabric selection is great. this is so so cute! and the fabrics are just beautiful together! Great colors! I wish I could select fabrics so well. It's really cute! I love the colors. I just read your post about your routine and I have to say, I miss the days when I had little ones and real routine to my day. My kids are both in school all day and I really crave being needed when they are gone :( You are SO organized too. I don't think I was ever THAT organized, but it really inspired me to consider organizing some sort a plan for my days. This is so nice. I LOVE the Michael Miller fabric. It adds a lot of interest to the back. And I especially like the name of the pattern… adorable. That is a great pattern. I love your fabric choices. Oh I love this one! Great pattern! Adorable (as usual). I have ordered this pattern and can't wait to start picking my fabrics! Its the colours that grab me, just great! I love this quilt too. The colors and fabrics are perfect. There you go again with your multiple fabric line, gorgeous quilts…. ;) Being talented and exprienced, you can just grab stuff from different lines and put it altogether into something beautiful – I'll have to work up to that skill! How do you do it?! You are so talented! Annabelle at annabelleserendipity.blogspot.com says … Love this pretty quilt. The fabrics are so well blended and particularly like the Michael Miller backing fabric. I am a great fan of your site and have been featuring since I began crafting and blogging. Thanks for all the beautiful things. So cute!! The simplicity of it allows those fabrics to really stand out. Great job! Love the very nice bright colors but also the textures of the materials you used. OMG this is so cute! Nice job Allison…I LOVE it! great choice of fabrics, awesome quilt! I love it! 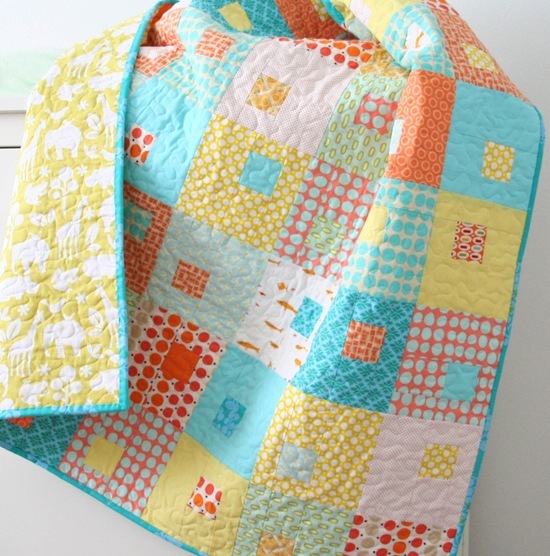 What an adorable little quilt for a baby! So sweet. Congratulations, your darling quilt made this week's Top 5 Hits at Singing With Birds. Come check it out, grab a button and have a great weekend! Super cute with all those lovely fabrics. Hope you had a good trip here and the weather held.